Hope was abound. The world was recovering from a devastating war. The world needs rebuilding and there is much to discuss. Conferences popped up faster than mushrooms after the rain. There was not much concern on the burning of fossil fuel. Environmental concerns were far from their mind. Jet setters represented their governments in a long gone era of posh global travel. Mr McKerron said that “Singapore is about to fulfill it destiny” as a series of United Nations Conferences are to be held in the Victoria Memorial Hall this year. It does not mean much for the layman trying to eek out a living in this long gone era. Just more high society people coming together to decide their fate in a nascent globalising world. The article starts with: A Post Office and a bank, will be among the facilities provided for the convenience of delegates, officials and members of the Press at the forthcoming meeting of the ECAFE (Economic Commission for Asia and the Far East), at the Victoria Memorial Hall, Singapore. ………………….. Major J. Gauntlett, organizing secretary of the United Nations in Singapore said yesterday that the two ticket boxes in front of the theater are being converted into a post office and a bank. Little did anyone guess how this launched a new genre of conference postmarks, cancellations and cachets for Malaya, Independent Malaya and Malaysia. Conference postmark collections are a specialised area of concordant FDCs. This area is sought after as it competes with the traditional postal history collectors. However, concordant collectors focus exclusively on the first day of issue or the first day of the event (commemorative cover). Our brief history of time through the conference postmarks starts here in the colony of Singapore, Malaya. I will confine myself to the official postmarks, cancellations and cachets. Conferences will include events where a number of countries come together to meet up on a specific issue. It is not easy to get into a conference venue. Security was as tight in the yesteryears as they are today (perhaps tighter now). Thus not many conference FDCs actually got out to the dealers. Many were posted by the delegates. Let us flash back to the fateful day on 10 October 1949! It was a lull period for the delegates as some made their way back to their countries, having put forward their point of view, sometimes heatedly, at the FAO Pre-Conference Regional Meeting. The meeting ended on 01 October 1949 and the 5th Session of ECAFE will only start on 20 October 1949. So nothing much was happening – cocktail receptions, sideline meetings, sightseeing….. The Russians did made the front page of the Singapore Free Press on 11 October 1949 (Russian Trouble at ECAFE) over the filling of identification cards. Contrary to the 24 August 1949 article which stated that the post office will be opened for ECAFE, it was actually opened throughout the conference! Mails sent out will carry a cachet from September to October 1949. With the United Nations flag fluttering in the equatorial sky, United Nations is in session in Singapore! Try and imagine a period with no handphone nor emails. Telegrams and mails were the order of the day. Overseas calls had to be booked in advance through complex switchboxes – pretty expensive stuff and elite! Thus a postal service was a necessity in such large conferences! Many delegates took the chance to send souvenir mails back to friends and family. “Wish you were here” was the catch phrase then as it is now! Ah, the privilege of such jobs in those days of scarcity. 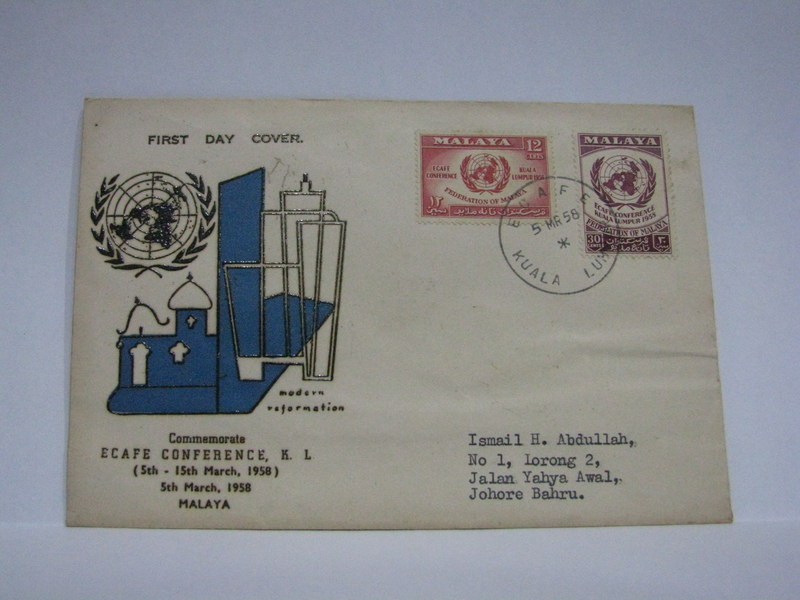 On 10 October 1949, the 75th Anniversary of UPU set of stamps were released in Malaya. Some sharp eyed delegates managed to make covers. It was a real match for any concordant collector – UPU – UN Conferences – Singapore on a nice set of Singapore UPU stamps! The cancellations reads: “UN CONFERENCE SINGAPORE”. There will not be anything grander than this event in Malaya for a number of years ….. about 9 years. Fast forward to 1958. ECAFE is back! This time to a newly independent Malaya. Again a period of high hopes and a desire to build the foundations for a nation. This conference will showcase Malaya and her role in the world. Did you know that the event was held in the then newly opened Dewan Tunku Abdul Rahman (Tunku Abdul Rahman Hall)? The hall was just opened on 24 February 1958. Where is Dewan Tunku Abdul Rahman???? Hint….Jalan Ampang. Further hint….read until the end of the article (be fair, do not scroll down!). Note: The hall is sometimes spelt out as Tengku Abdul Rahman Hall or Dewan Tuanku Abdul Rahman. Kuala Lumpur, Fri – The Malayan Postal Authorities will mark the ECAFE conference here from March 5 to 15 with a special issue of stamps. Two stamps a red 12-cent and purple 30-cent will bear the symbol of the United Nations Organisation and the title “ECAFE Conference, Kuala Lumpur, 1958”. The stamps will be on sale from March 5. The stamp dealers and printers were busying themselves to produce what we call today as the private covers. In those days, the private covers can be bought outside the post offices and in some instances….the postal clerk also sold the private covers over the counter! Kuala Lumpur, Sat – A special issue of 12-cent and 30-cent postage stamps will be on sale at all post offices and postal agencies throughout the Federation on Wednesday to commemorate the ECAFE Conference………..They will also be available at the Stamp Bureau of the Singapore General Post office. 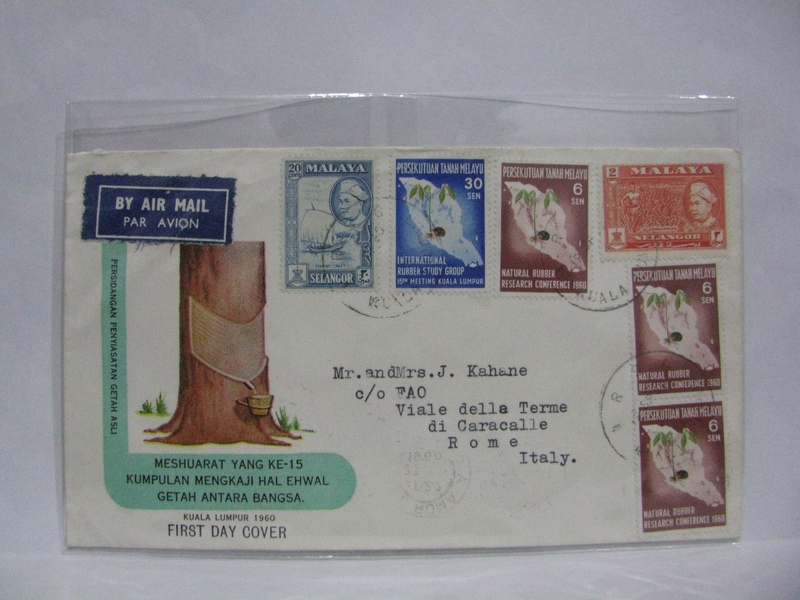 Thus on this day, the set of stamps were released and perhaps what are harder to find today are the private covers with the “ECAFE KUALA LUMPUR” cancellation. There are some (as expected) in the hands of dealers who managed to get the covers sent at the venue. Malaya, fresh from her experience in hosting ECAFE, will soon host something dearer to her economy – the rubber industry. Malaya was the then leading rubber producer in the world. It is the 15th Meeting of the International Rubber Study Group (IRSG). The IRSG was established in 1944 in Singapore. It is an inter-governmental organisation that brought together producers and consumers. The conference will still be held in Dewan Tunku Abdul Rahman as the hall is the premier place to host conferences. Kuala Lumpur, Thurs – The Minister of Works, Posts and Telecommunications, Dato V.T. 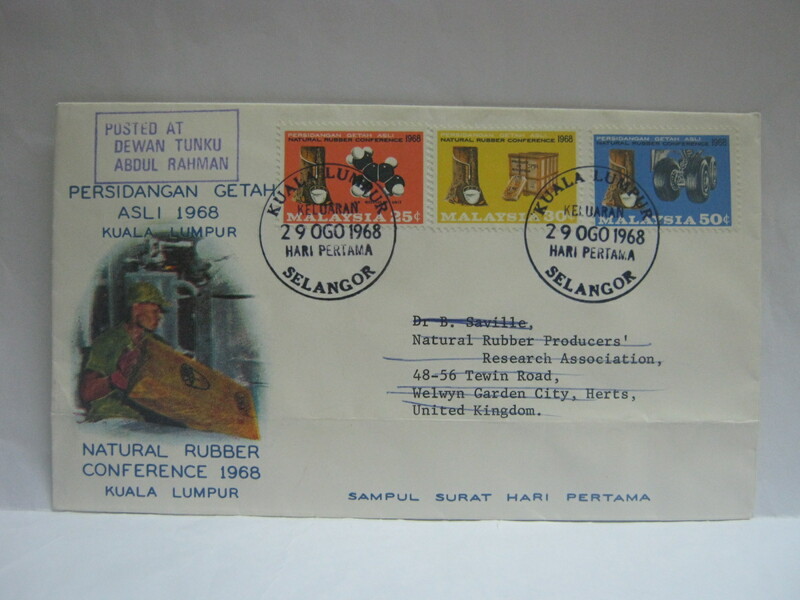 Sambanthan, announced today that special stamps would be issued to commemorate the Natural Rubber Research Conference, 1960, and the 15th Meeting of the International Rubber Study Group. The two stamps, one six-cent and the other 30-cent, will be on sale from Sept. 19 for three months. Official first day covers and special booklets explaining the stamps and with information on rubber will be on sale from Sept. 2. SINGAPORE, Tues.— A six-cent stamp to commemorate the Natural Rubber Research conference this year and a 30-cent stamp to commemorate the International Rubber Study Group’s 15th meeting, will be sold in all post offices in the Federation and Singapore on Sept. 19. In Singapore, the official first day covers will be on sale from Sept. 2 and can be bought at the Stamp Bureau, General Post Office. Right, the dealers know the drill…….print the private covers and get them to the post offices before 19 September 1960! However, no private covers have been seen posted from Dewan Tunku Abdul Rahman! The first day covers sent from the venue bears the much sought after cancellation “IRSG KUALA LUMPUR”. Very few are seen in the market. Most of the private covers are cancelled with the common Kuala Lumpur, Ipoh, Penang and Singapore cancellations. Here is a cover sent back to Italy. Italy was one of the 20 countries attending the meeting. On this day, the Langkap Post Office was opened! There was a special handstamp used in Langkap Post Office. 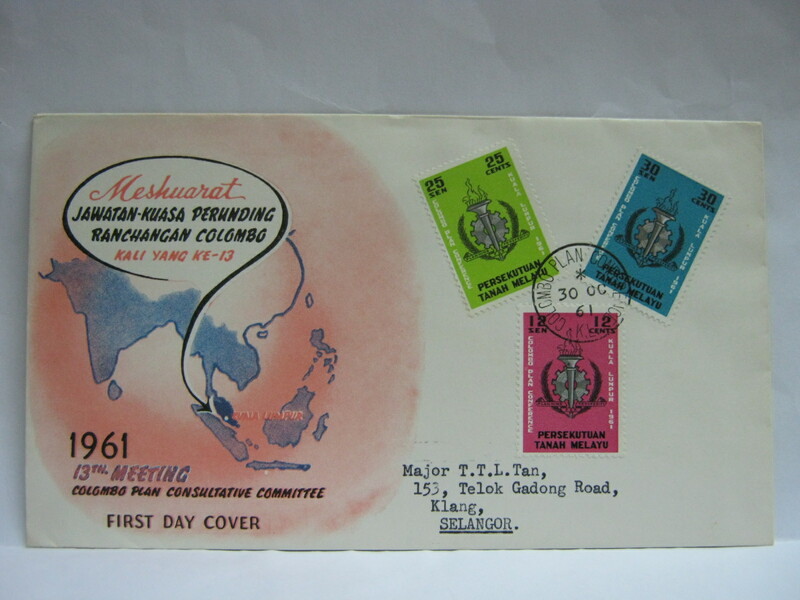 This is also the first Conference FDC to the words Persekutuan Tanah Melayu (not Malaya) was used on the stamps. 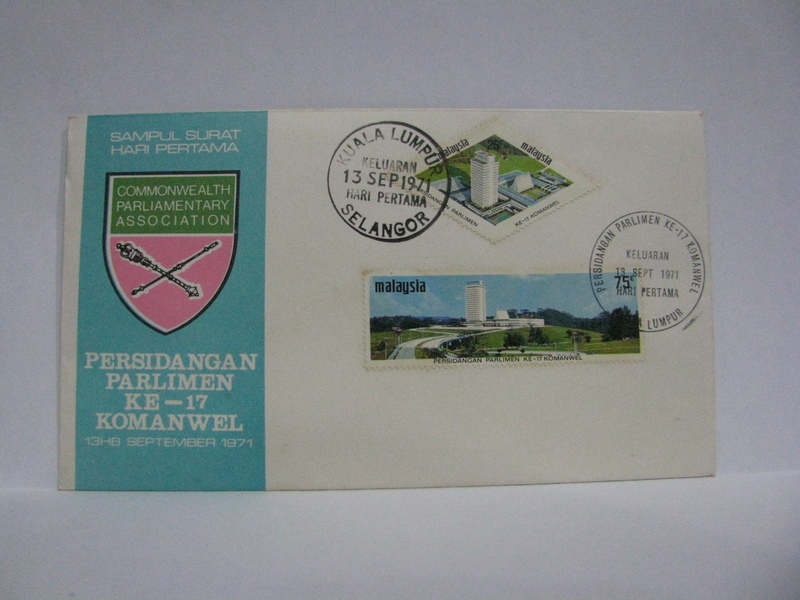 The word Malaya was dropped from the stamps since 12 September 1959 Inauguration of Parliament issue. Kuala Lumpur, Tues. – Telecommunications experts will meet here on June 28 to consider improvements to submarine cables communications. The meeting – The South East Asia Commonwealth Cable Conference – will be opened by the Prime Minister, Tengku Abdul Rahman. Delegates will be from Australia, Ceylon, Canada, India, Pakistan, Britain, New Zealand, Singapore and Malaya. 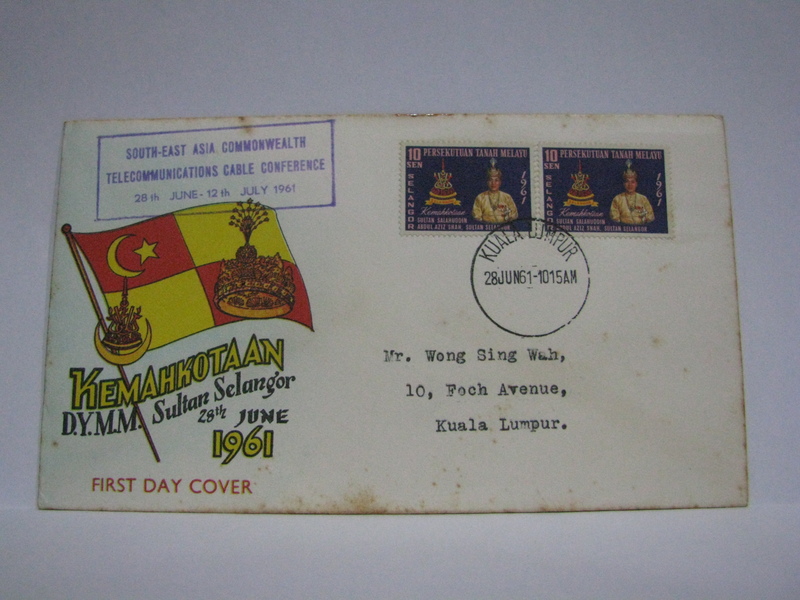 A cachet was applied manually on the first day covers in Kuala Lumpur for the Coronation of His Highness the Sultan of Selangor as the conference date coincides with the coronation day. The box handstamp reads: “SOUTH-EAST ASIA COMMONWEALTH TELECOMMUNICATIONS CABLE CONFERENCE 28th JUNE – 12th JULY 1961”. It is very common. 1961 seems to be a busy year. 30 October to 18 November 1961, Malaya was to host the 13th Meeting of the Colombo Plan Consultative Committee. 21 nations attended the conference. This time the mood was on the unequal balance and the dispute over trade barriers. The issue of the Republic of Korea trying to gain membership was hot on the press with many diplomatic wrangling in the background. Such was the situation at that time. The conference was still held in Dewan Tunku Abdul Rahman. A special cancellation with the words “COLOMBO PLAN CONFERENCE KL” was made available. It is not easy to come by the cover but the cover below indicates that it is not rare, just being kept somewhere by someone. Major T.T.L. Tan is also a collector of concordant covers and he usually make a number of covers with/for his friends. Thus his name appearing on a cover will give you an indication the same covers are out there to be discovered. 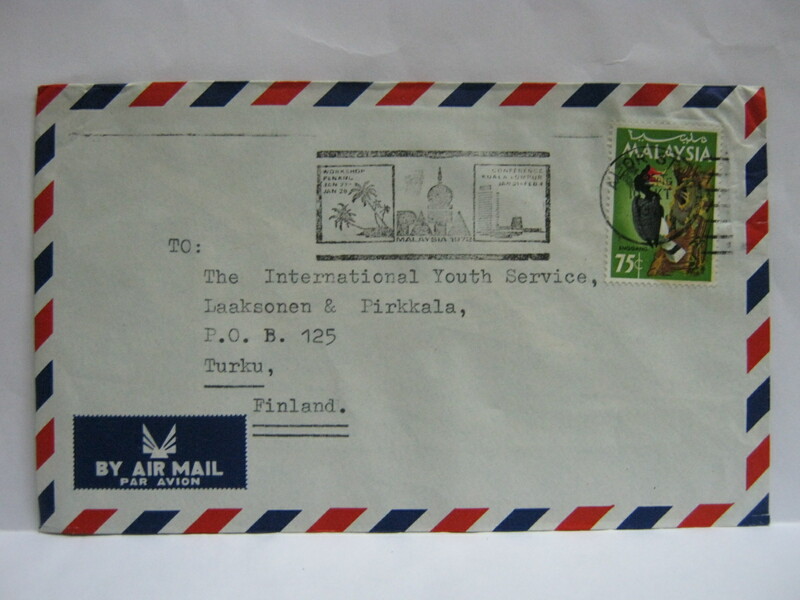 This was also the last conference postmark before Malaya becomes Malaysia! 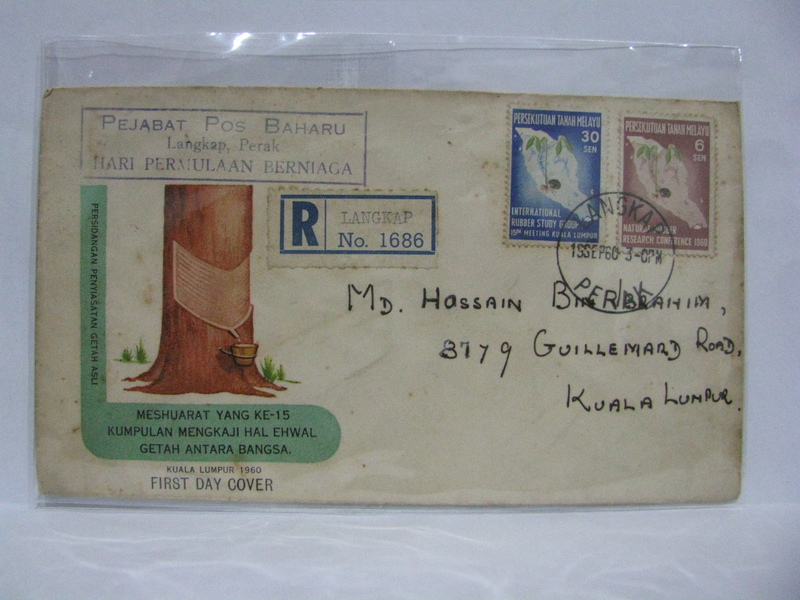 Trivia: There was also a postal slogan which was available on the first day of issue recorded in Kuala Lumpur and Penang. Let us roll back a bit in 1961. MALAYSIA – As Sure As the Sun Must Rise! BERJAYA! By 1963, the dynamics have changed and Malaysia has replaced Malaya. 29 Commonwealth countries attended the conference. The world was having conflicts and skirmishes. That includes the Commonwealth countries. Peace and foreign intervention were the order of the day and that set the tone of the conference. The conference was held in our spanking new Parliament House! A special cancellation with “IX CPA CONF K LUMPUR” was made available. That basically is an abbreviation of 9th “Commonwealth Parliamentary Association Conference Kuala Lumpur”. This cancellation is uncommon but not rare. ……..For the philatelists among you, the Hon’ble Minister of Works, Posts and Telecommunications has arranged the issue of commemorative stamps and First Day Covers; we would thank the Minister of Works, Posts and Telecommunications and the Postmaster-General and staff for this very valuable and memorable gesture. ……..
Once again the rubber conference was held at Dewan Tunku Abdul Rahman. The conference ran from 28 August to 05 September 1968. Over 500 delegates from various stakeholders from 28 countries attended the event far surpassing the 1960 conference which had about 300 participants. – Information from Proceedings (Part 1), Volume 21 Journal of Rubber Research Institute of Malaya. Note: Images of the stamps were included in the Proceedings (Part 1). The stamps and First Day Covers were released the next day. A cachet “POSTED AT DEWAN TUNKU ABDUL RAHMAN” was applied to the covers posted from the conference venue. This is extremely rare. It is perhaps the rarest of all the conference cancellations. The 3rd Ministerial Meeting of ASEAN was held in Cameron Highlands on 16 and 17 December 1969. This was the turning point of the normalisation of ASEAN member countries. Diplomatic ties between Malaysia and Philippines will be resumed. Friendship will be reaffirmed. Malaysia, Thailand, Singapore, Indonesia and Philippines were the member countries and in attendance. In addition, Malaysia invited Laos and Vietnam to join as guests and observers. 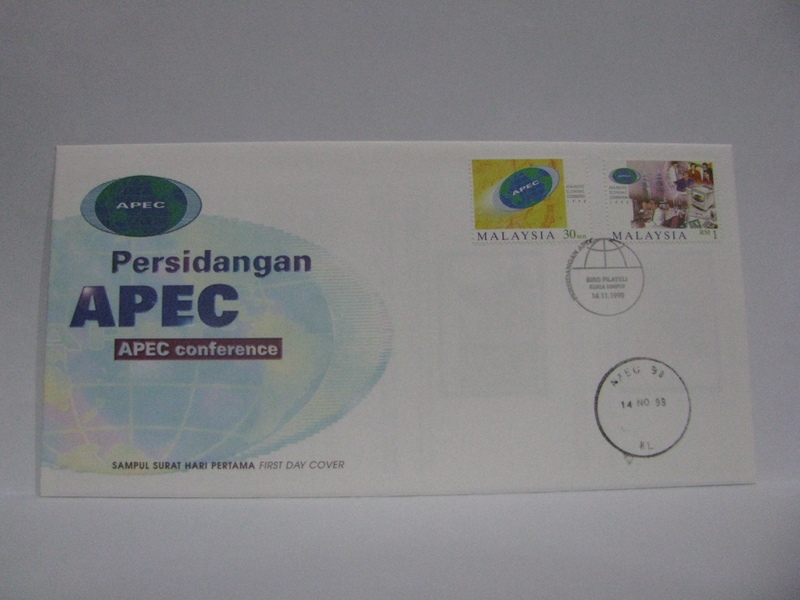 A postal service was set up with “ASEAN CAMERON HIGHLANDS” was used as the conference postmark. This postmark is scarce. KUALA LUMPUR, Wed. – Tun (Dr.) Ismail will be the first speaker when the plenary sessions of the 17th Commonwealth Parliamentary Conference opens here on Monday. After the Yang di-Per-tuan Agong has officially opened the conference, the Deputy Prime Minister will address the delegates on “South-east Asia and the Indian Ocean: Security and Neutrality.”….. This would be the second Commonwealth Parliamentary Conference to be held in Kuala Lumpur in the Parliament House. This time there is also a special cancellation available for the occasion. 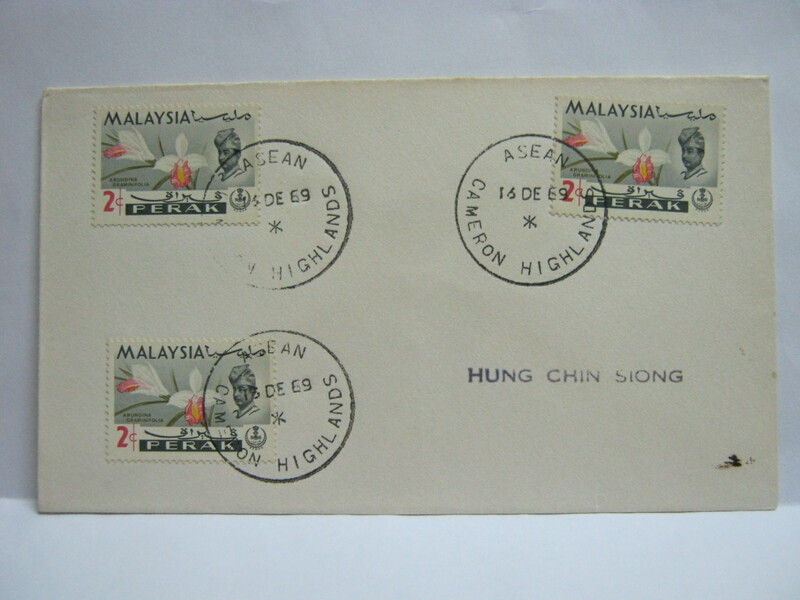 The special cancellation is very common unlike the cancellation in 1963. 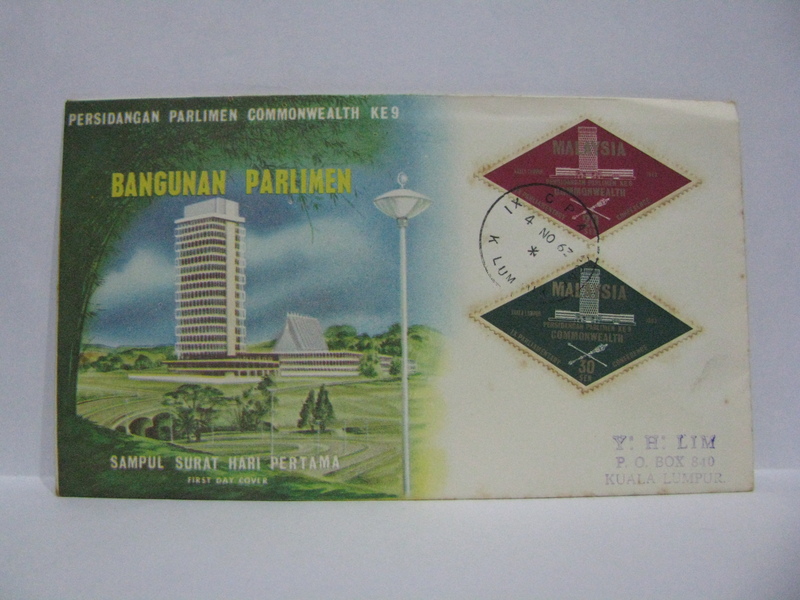 The special cancellation has the words “PERSIDANGAN PARLIMEN KE-17 KOMANWEL KUALA LUMPUR” (it is the Malay text for 17th Commonwealth Parliamentary Conference Kuala Lumpur). I think by now you know that the next conference venue is decided a few years ahead (usually at the end of the previous conference). Thus the 1972 PATA was decided in 1969! Well, again another special cancellation was made available for this conference. 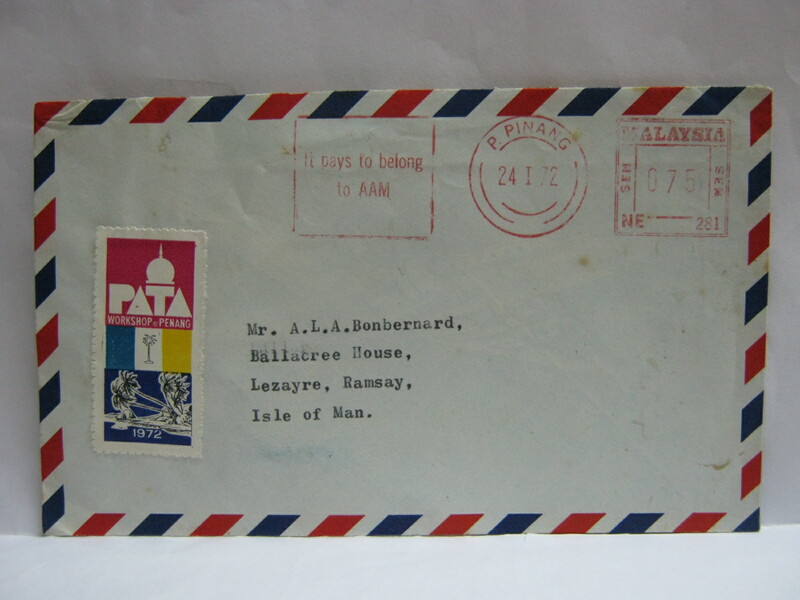 A postal slogan and label were also used to promote the PATA Workshop in Penang. 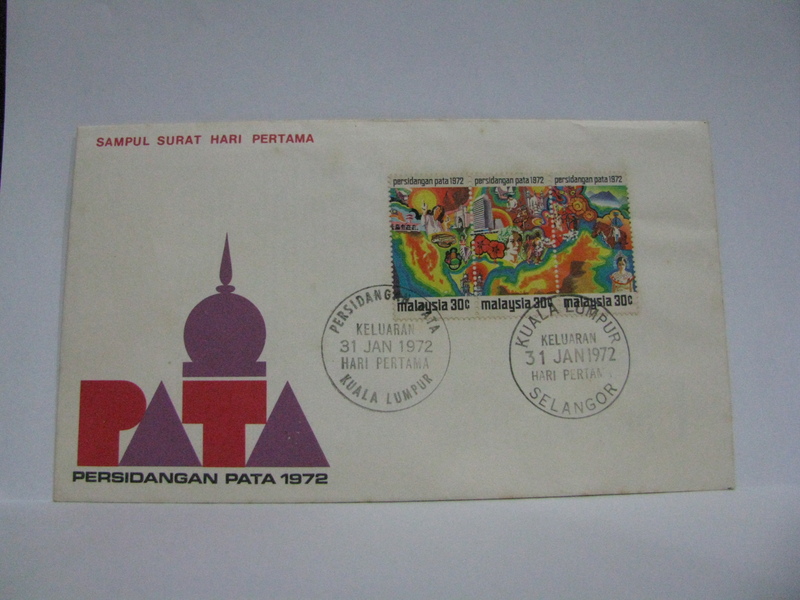 The cancellation reads “PERSIDANGAN PATA KUALA LUMPUR” (PATA Conference Kuala Lumpur). Kuala Lumpur, Sun – The Prime Minister, Datuk Hussein Onn will open the fourth Commonwealth postal conference at the Dewan Tunku Abdul Rahman here on July 10. Trivia: Did you know that Datuk (conferred in 2014) M Rajasingam was the man behind Malaysia’s poscode system and the introduction of the Mini Post Office? A special cancellation bearing Persidangan Pentadbiran Pos Komenwel Ke 4 (4th Commonwealth Postal Administration Conference) was made available. It will be a long time before another special cancellation for a conference comes out again. Many conferences were held in Putra World Trade Centre and Kuala Lumpur Convention Centre. These venues have attached post offices and thus it is just a matter of going over to the post office to get the concordant cancellation. No special conference cancellations were released until……20 years later! 1998: Economic and political turmoil were the order of the day as representatives from 21 Asia Pacific Economic Cooperation (APEC) countries met up in the Palace of the Golden Horses. This conference is important enough to have a conference post office. Perhaps it was that the location of the nearest post office was not “near” enough. In any case, this was (at the point of publishing this article) the last of the conference cancellations. The conference cancellation is just simply “APEC 98 KL”. Thus our journey spanning 49 years ends here! The information for this article has been picked up from various printed, digital and verbal sources. As memory fades and those with first hand account passes on, bits and pieces of the history will disappear. If you have further information, do contact me to update the article.